Lillie A. Estes sparked ideas, hatched plans, and was continually building networks to address the root causes of poverty and injustice. Here she is speaking in Washington, DC at the Center for Global Policy Solutions. Lillie A. Estes: A lot of what I do is repetitious conversation to build people emotionality, to build their confidence, and get them to want to participate. 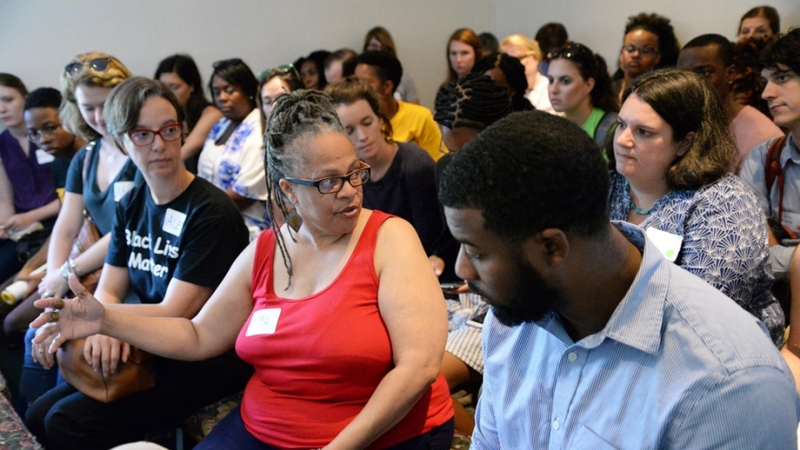 Over four decades in Richmond, Community Strategist Lillie Estes brought together people across age, race, gender, and economic status to solve problems collectively. Arthur Burton: Lillie was the lover that I never kissed or hugged. She was my sister, but she was not my blood. And she walked with me for 20 years in everything I did and that was our life. One of Estes oldest friends and collaborators is political activist Arthur Burton. Burton: Lillie was always promoting my work! Burton is the Executive Director of Kinfolk Community. Estes helped him when he ran for office; they worked to shut down Richmond public schools built on landfills; and they mobilized against the closure of Dove Court public housing. Burton: We created a campaign called “This is Our Home, This is Our Land” and we were just going to declare ownership of Dove Court and she was working on the NAACP National resolution for one to one housing replacement at the time. This work led to RePHRAME, Residents of Public Housing in Richmond Against Mass Eviction. This was a decade before evictions here captured national headlines. Kim Rolla got involved with the group right after college. Kim Rolla: For many years the residents there were organized with RePHRAME have been telling the stories of the hardships caused by some of RRHA’s policies and I think that they knew that before the national headlines did and it was really just a matter of whether people would listen to and value that knowledge. The group won additional seats for residents on the RRHA Board of Commissioners. They changed a policy giving residents a local option to pay rent, instead of having send it out of state, risking late payments and checks getting lost in the mail. Rolla: There are little things like that helped people feel their power, that people talk about a decade later that may not make it into Richmond history books. Estes was everywhere in Richmond, at public meetings and forums, marches and rallies. She served on boards and advisory committees, and brought Art Burton’s strategy for wealth building to the city’s Anti-Poverty Commission. That work eventually led to the City’s Office of Community Wealth Building. David Harris: There are people and individuals in every community in this country who are doing work on the ground to rebuild their communities in the face of kind of devastation wrought by a system of racism and Injustice. Estes worked closely with David Harris and Harvard’s Charles Hamilton Houston Institute as she built a framework for Community Justice in Richmond. Harris: She understood and was determined to do things differently. From my perspective and in terms of what we think of as Community Justice, that's what we need. We can't have these kind of hierarchic “I know more than you know, therefore we'll do it my way” strategies. Because we're talking about people and communities that have been shut out, marginalized, silenced for so long and this is something that Lillie understood. There will be missteps, we’ll make mistakes. But that’s the other piece of her that was really special, was that she was full of love. It’s a sentimental thing, but she had a feeling that really part of the work had to have to do with creating an environment of trust and love and mutuality. At Roots of Woodville, a community garden Estes helped launch near Creighton Court, Trey Hartt remembers the conversation here that led to the Community Justice Film Series. Trey Hartt: That moment, which was just supposed to be a trip out to the garden so she can check on her strawberries, became literally a seed that grew into something much bigger and has had so much impact. The films and dialogue reflected six interconnected themes of Community Justice developed by Estes: education, whole body and well being, public safety, housing, transportation, and job creation and wealth building. The year and a half long series grew into the Community Justice Network. Hartt: Lillie was adamant that the Community Justice Network was not going to be an organization and those of us that helped grow that idea really stand behind that because it's not about building more institutions. It's about calling on the powers that currently exists, whether you're a nonprofit organization or an elected official or everyday community member to understand the value of addressing Community Justice in all the ways that we exist in our worlds. Hartt was very close to Estes, who he says fully embraced him and his husband. Hartt: That is such a rare thing right now to feel in a gay marriage or in a gay relationship or queer relationship, to have people that are from a different generation, different race, different class background, all the things-- accept you so completely and that was Lillie, that was the essence of who Lillie was. Duron Chavis: This is the Charles S. Gilpin Community Farm. Lewis Ginter’s Duron Chavis admires another one of Lillie Estes’ community-led projects, a large fruit orchard with plum, persimmon and apple trees in Gilpin Court. Duron Chavis: People do care. It's like you create an infrastructure that people can connect to and participate in is what this has always been about. It’s like, how do you put the resources in the community? That people can parlay off that and you know make their own. Chavis has known Estes for about 15 years. They worked together on the “Unpacking the 2010 Census” dialogues, then on the City’s Anti-Poverty Commission. Chavis: She would rail about people saying stuff publicly about them being supportive of community and community engagement and investment in community, but then them not backing it up with the policies and resources. And then when they don't back it up with policies and resources then they like wonder why stuff don't work. She was always like this was some BS. Lillie Estes didn’t just work on big initiatives or policy changes. She had everybody’s backs, especially her neighbors in Gilpin Court, says Massachusetts-based author and professor Jean Trounstine. Jean Trounstine: When one young man or old man, I don't remember, got picked up for some kind of drug charge she was relentless in trying to find out why what happened to him. Why was he taken? What's going on with him? When’s he getting out? She cared for what happened to the regular person on this street as much as anyone. And I thought when the legislature had a moment of silence for her and they dismissed the legislature in honor of Lillie A Estes, it's said a lot. People in powerful places recognized her and the person who had drug problems recognized her and depended on her. I think that means a lot, that someone can forge those kinds of bonds. While her impact was vast, Duron Chavis asks if Richmond deserved Lillie A. Estes? Chavis: Lillie was a one-of-a-kind Jewel. She was really a rarity. I knew how she was marginalized, behind the scenes, people from the city, local government, philanthropy, how they marginalized her. They didn't put money into her initiatives and efforts that she was pushing forward, they didn't support it, you know, but she plugged along. Life expectancy in Gilpin Court is 63 years old, according to research by VCU. A couple miles away in Westover Hills, it’s 83. Lillie Estes was 59 when she passed. For Harvard’s David Harris, that should shake government and institutional leaders who are praising her now. Harris: Lily was everywhere, right? Everybody relied on her. “We need some community input. Let's get Lillie Estes. She'll help us.” And always for free, right? Nobody paid her. And yes, she knew and now look I'm going to tell you, not only would Richmond be in a much better place in terms of understanding and dealing with the real inequities and poverty that continue to haunt it and have haunted it for a long time, but she might still be alive, right? She might still be alive because maybe she would have had the resources to take care of herself. Government leaders and funders may have missed opportunities to elevate the solutions Lillie Estes seeded throughout the City. But her work will continue, through the people she mentored and loved, like community organizer Rebecca Keel. Rebecca Keel: As Lillie would say “Get in where you fit in.” Become part of this movement work, don't be complacent, don't be passive while history is happening to you, actually be an actor in all of this. Send your condolences, but really honor Lillie by stepping up, by really creating change in your community and in this world because lord knows we need it. Lillie’s friends and collaborators say she didn’t give people easy answers. But she embraced people being their authentic selves. And in the face of so many battles, she laughed, smiled and hugged. Harris: Her biggest impact has yet to be seen, and I think it has to do with how we keep her work going. Hartt: What I think Lillie would want right now is for us just to do better and do what is right. Chavis: I appreciate Lillie for being just honest, raw, rooted, you know and a true collaborator for justice, man, she was about it. And I think the best of who she was is something that we all can learn from. A celebration of the life of Lillie A. Estes is scheduled for 11:00 am Tuesday at Sixth Mount Zion Baptist Church. Catherine Komp, WCVE News. WCVE's Yasmine Jumaa contributed to this story.